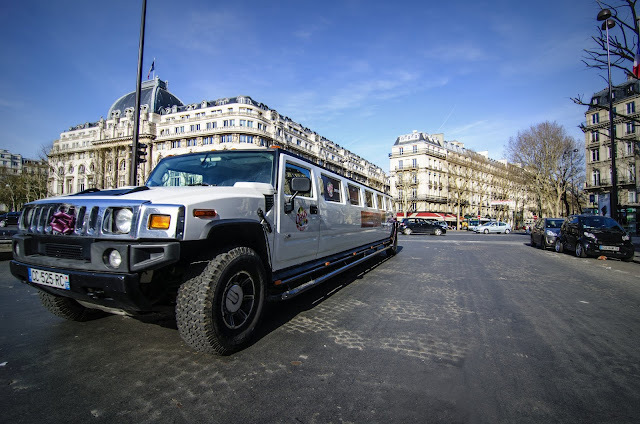 Believe it or not there are Hummers in Paris! And not just "small" ones we also have limos! Hence this one that I photographed at rue La Boétie... Needless to say that this kind of vehicles is not exactly adapted to the small streets of Paris nor to the French price of gas/petrol (6,15 € a gallon!) nor even to the Parisian parking spaces that are fitted for European size cars! Have a nice weekend. Wau ,would that be the perfect car..to have the PDP pinic??? pitty I cant make it to the 5th May...only on the 22 May...Merci Eric for the wonderful photo...I agree,where do they park this car??? Well, we'll have a drink when you're here then! Hmm. A stretch vintage Citroën would be so much cuter, but I guess this Hummer gets the desired attention its occupants are seeking! Great angle, Eric. Bon weekend! It actually belongs to an event planning company, so yes, it's designed to attract attention. Great photo, and your comments are perfect. I've always thought Hummers in any form should be illegal other than for military use. You note a direct cost (fuel), but the pollution of such vehicles is silly in the 21st century. Good lord, are you so desperate for attention? I've never been a fan of ostentatious limousines. Of course, I like to operate under the radar. Oh, and by the way: I am very glad they arrested the second Boston bomber. We will find out more about these two bizarre, murderous characters. I'm glad too; it allowed me to go out today! obviously this is a publicity stunt but first I thought this was rapper b2zoo and the boulbi boys showing off their latest ride! I am lucky enough to live in a part of the world where the word "hummer" = "somebody who hums". I assume that in the US it means "a needlessly huge vehicle which uses far too much fuel". If I am correct, I apologise to Paris on behalf of the English-speaking world.